The Malagash Oyster is indigenous to the Malagash Harbour in Nova Scotia, where the native Mi’kmaq and European settlers originally gathered them in the early 1800’s. 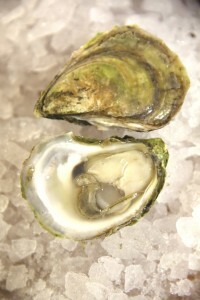 The aboriginal Mi’kmaq made extensive historical use of oysters in addition to other shell and fin-fish in the region. Malagash Oysters are from the Atlantic Oyster species known as Crassostrea Virginica. They are sandy in colour, with tints of green. They have a sweet adductor muscle with firm meat, and a complex flavour of wild mushroom lingering into a vegetal, sweet, earthy finish. The Malagash is a bottom-cultured oyster with a nice hard shell making shucking a pleasure, even for the less experienced. Its shape ranges from a round, deep cup to a more elongated, medium depth cup. With roughly 30 000 oysters harvested per week, these tasty indigenous shellfish are available on the Canadian market, and exported worldwide. Unfortunately, due to the cold temperatures along the Nova Scotia coastline, reproductive oyster beds are very limited. Thus, well established and reproducing oyster regions represent the last, isolated, Northern outposts of the species.Given the isolated nature of favourable oyster growing regions in Nova Scotia, each area possesses its own unique marine environmentt, including variations in salinity, temperature, tidal shifts, and mineral/chemical composition. This in turn, leads to the oysters of each area expressing different characteristics in shell shape, and, more importantly, in taste. Anything that alters or destroys this rare environment is putting this oyster at risk. Today, a major concern is the change in water composition due to silting, pollution, shoreline destruction and ocean acidification. To protect these delicious indigenous oysters we must protect their habitat from such fatalities.